If your Tupperware containers are falling out whenever you open the cabinet, or your pickle jars have found a home next to the cereal boxes, it’s time to declutter your kitchen. Messy, disorganized kitchens are a nuisance to cook in, but if you have a weekend to spare, you can have a decluttered, organized kitchen. If you haven’t been to a home goods store lately, you’d be amazed at the selection of innovative organizers for every square inch of your home. There are specialty drawer organizers that you can mix and match to keep small items in their places. Cabinet organizers are particularly exciting. Look for pull-outs, two-tier sliding systems, specialty lid holders, and dividers that are used for holding cutting boards and baking sheets upright. Most families have more stemware and oversized coffee mugs than they actually use. Sort through your collection and put everything into three piles: Used within the past month, used within the past year, and never used. Keep everything in the first pile and get rid of everything in the third pile. The second pile you can keep only if there’s room—if not, say goodbye to it. In a small, cluttered kitchen, there isn’t much room for specialty kitchenware like garlic presses (pulverize a clove with the flat side of a knife) or electric quesadilla makers (just use a baking sheet and the oven). Instead, make basic items serve multiple purposes. Instead of getting a fancy spaghetti pot with its own strainer, break dry pasta in half and use a smaller sauce pot. Every family has a few useless, small kitchen appliances they never use. Maybe your distant cousin sent you a fondue pot as a wedding gift or you’ve somehow acquired a countertop rotisserie that’s more trouble than it’s worth. If you can’t bring yourself to give away or sell these items, perch them on top of your kitchen cabinets instead. Many kitchens have plenty of space between the top of the cabinets and the ceiling. Putting infrequently used items up there will free up valuable real estate elsewhere in your kitchen. If you have a couple of square feet of wall space, you can make it serve double duty. Hang a sturdy rod from the wall. Hang strong hooks from the rod and use the hooks to house items like lightweight skillets or a pasta strainer. You can also hang smaller items there, like spatulas, whisks, and serving spoons. Keeping your kitchen tidy and well-organized is easier when it’s within a thoughtfully designed home. Montchanin Builders understands the busy lifestyles of modern families, and we design our homes to meet those needs. 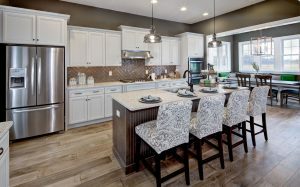 Families in the Wilmington, Delaware area are invited to tour our new construction homes in the master-planned communities of Darley Green, the Town of Whitehall, and our newest community, The Overlook at Rockford Falls. Each of our homes is built by master craftsmen with an eye to aesthetic details. You’ll feel right at home in your new chef’s kitchen, which may feature gorgeous birch or maple cabinets in your choice of stain, top-of-the-line appliances, beautiful granite countertops, and of course, plenty of storage possibilities. Call Montchanin Builders today!